A large group of Detroit police officers tackled a man wanted for connection to a homicide in the middle of I-75 Friday after he led them on a high-speed vehicle pursuit throughout the city and then fled from his car on foot into traffic on the interstate. 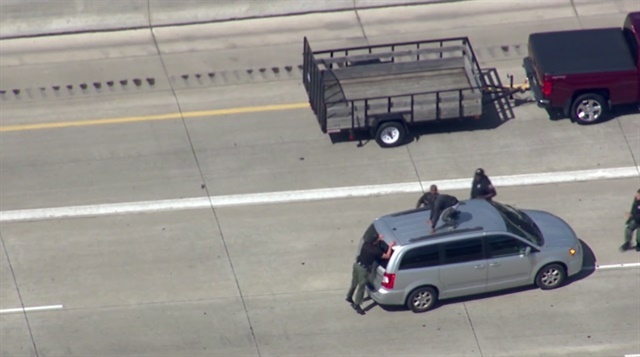 After a long chase, the man's SUV had a flat, forcing him to park on the shoulder of the highway. He got out of the SUV, jumped over the median, and ran into oncoming traffic. He tried to hurdle a minivan and got flipped onto the hood, where police officers trapped him. When he came down off the minivan, he was tackled by several police officers and taken into custody, ClickonDetroit reports.